Let me begin by stating for the record that I am a grown man, reasonably rational most of the time. Let me also state that I understand, intellectually, that the Boston Red Sox are actually a corporation that has nothing to do with me. But of course, if you are a member of Red Sox Nation, all the rationality in the world will not help you put things in perspective. If you are a member of Red sox Nation, there is no perspective, save one. You love the Red Sox. My father took me to Fenway Park for the first time when I was five. We had season tickets behind third base. I remember, as if it were yesterday the cries of the peanut vendors, the hawkers of afternoon papers (when there still were afternoon papers), the walk through the dark tunnel in the bowels of the park, and emerging to the stunning view of the dazzling green field. Boston is one of the few places in the country where baseball is still and always will be number one. The Patriots have won two Super Bowls but I assure you, tomorrow’s parade in Boston will dwarf any demonstration connected with football, however lofty the achievement. I played Little Leaugue baseball, and senior Little League, and Babe Ruth league. As soon as the weather turned warm enough, my Saturdays would consist of riding my bike to the ballfield at dawn, and returning home after dark. To this day, when I first whiff spring in the air, the first thought that rockets to my brain is "baseball!" My father was born in 1928 and died before seeing the Red Sox win. My son has a Pedro Martinez poster on his wall. I took him to Fenway when he was five, as well. I still have everything connected with that night in a big envelope. The tickets, the scorecard, a record of what he ate and said. Someday maybe he’ll give it to his son. It’s crazy, I know. Irrational. Silly. The Boston Red Sox is a for-profit business that has nothing to do with me. The players come and go. The team is bought and sold. I am rooting for laundry. But so what? Because this week I am happy. Happy, happy, happy. 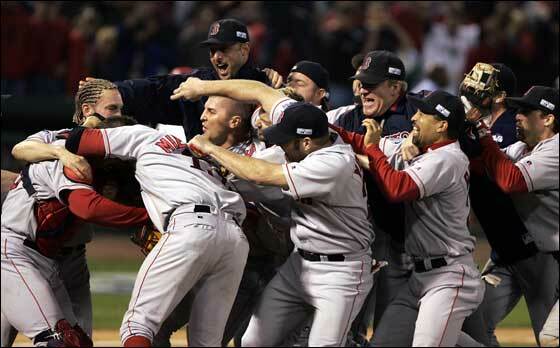 My team, the Boston Red Sox, has buried the Yankees and then won the World Series. Tomorrow there will be the parade to end all parades. You can’t tell me I had nothing to do with it. 2. Your relationship with your clients often has little to do with the quality of the product or the actual result. 3. If you create a family, or a sense of belonging, your client base will stay with you through good times and bad. 4. Attitude is everything. Have fun.